How about an electric harmonica, or even a midi harmonica? In an increasingly high-tech world, the harmonica seems relatively untouched by technology. The venerable Hohner Marine Band is pretty much the same now as it was when it was introduced more than a century ago. However, as we already have electric guitars, drum machines, electronic keyboards, wind-controlled synthesisers, etc., it is not surprising that there have been many attempts at producing an electronic harmonica. What is surprising, is that few of the attempts so far have resulted in an instrument that has been a commercial success. The most well-known electronic harmonica-type instrument is the Millioniser. Invented by the late Walter Miller, this device has been used by a few players such as Eddie Gordon and Dutch jazz maestro Wim Dijkgraaf. The inventor was always quick to point out that the Millioniser is NOT a harmonica - it is a device that allows a harmonica player to use their existing technique to control a synthesiser. Rather than having a series of holes into which the player blows, there is a mouthpiece with a single hole in it. This mouthpiece slides back and forth along the front of the device and its position determines which notes you get when you blow and draw. The note layout can be changed to suit the player's preference and there are a set of buttons covering not only the usual semitone raise in pitch, but also various other degrees of pitch shifting, both up and down and a variety of tonal changes. Recent improvements and a dramatic reduction in price may help to make it more popular. You can read more about the Millioniser here and here. I was surprised to learn just how long a pedigree the electric harmonica has. The earliest one that I have so far discovered dates back to shortly after WWI. US Patent 1390984 was granted in 1921 to Ralph Conover and Leo Hull, for what they called a "Circuit Closer for Musical Instruments". This was a device with a simple harmonica-like mouthpiece, but instead of having reeds, each hole lead to a pair of switches, one operated by blowing, the other by drawing, allowing the player to control any electrically operated instrument connected to it. Long before the advent of MIDI, you could have used your skill on the harmonica to control all manner of other sounds. Or at least you could have done, if this idea had ever made it to a commercial product! A more complex device was patented in 1948, by Alfred O. Williams of Michigan. 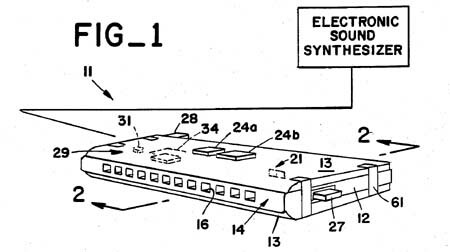 This took the form of a chromatic styled instrument also having electrical contacts instead of reeds, which then operated tone generators similar to those found in a Hammond organ. Another invention described as a "musical control device" was patented in the early sixties. Much like the Connover and Hull invention, its main purpose was as a small remote control unit for other instruments, rather than as an electric harmonica per se. Around the same time, various professional players were experimenting with one-off electronic instruments for their own use. Leo Diamond used a couple of specially-constructed electronic harmonicas for his album "Exciting Sounds From Romantic Places". British player Ronald Chesney featured what he called his "talking harmonica" on the BBC Radio show "Educating Archie". In about 1960, he recorded an E.P. record using this instrument, called "Johnny's Talking Harmonica", a sort of "Sparky's Magic Piano" novelty record for kids, that featured the harmonica playing such tunes as "Three Blind Mice" and actually speaking the words. Strictly speaking, this wasn't an electric harmonica as such, but a normal harmonica that was electrically amplified with the output sent via a tube to someone's mouth. As Chesney played the harmonica, the other person shaped the tone with his mouth in front of a microphone, making it sound like the harmonica was talking. Similar devices became popular for electric guitars and keyboards during the 1970s, featured on such hits as Joe Walsh's "Rocky Mountain Way" and Peter Frampton's "Show Me The Way". In the seventies, various instruments were designed that used ordinary reeds in conjunction with electronics, as well as some purely electronic instruments. At the top of this page is a scan of a magazine picture of someone playing one of Hohner's designs from the late seventies - it looks like he is blowing into a sandwich toaster! Sadly, although not surprisingly, this never seems to have made it beyond Hohner's R&D department. The first commercially produced electric harmonica seems to have been the Elemonica 101, manufactured by the Japanese company Hoshiden Inc. in the mid 1970s. It was based around a 21-reed diatonic, essentially like the typical Asian-style tremolo, but using single reeds instead of paired reeds. It had a built-in pick-up system that allowed it to be connected directly to an amplifier without the need for a microphone. The eighties brought us MIDI (Musical Instrument Digital Interface) - whilst never quite the ultimate universal electronic musical language that it was claimed to be, it made the Millioniser a more exciting instrument than it originally was (the first Millionisers lacked a MIDI output), enabling players to use their chromatic harmonica skills to control any sound that modern synthesisers and samplers are capable of producing. Into the nineties and the innovations continued. Over on the American West Coast, Ron Schille patented a design for an instrument (again, strictly speaking it is a controller, as it has no sound producing means of its own) that can transfer virtually all of a player's techniques - tremolo, vibrato, bent notes, wah-wahs, etc. - into a MIDI code, to be applied to just about any sound you can imagine. Known as the ECH (Electronic Chromatic Harmonica) the most recent prototype looks like a slightly scaled-down version of the Hohner CX-12, but we have yet to see a commercial version of it. Another West Coast inventor was James A. Wheaton of Fairfax, California. He patented a harmonica-style controller that had breath sensors that used a newly designed ultra-mini anemometer to respond to the player's breath. The patent also mentions transducers to sense the pressure of lips and fingers, which could then be assigned to control bends or tonal colourations. It also includes a built in microphone to pick up the performer's vocal sounds, as well as a typical thumb wheel controller and an assortment of on-board switches. The patent is owned by Yamaha who also own a number of other patents for harmonicas and harmonica-related items, but they don't exactly seem to be flooding the market with these things. Sadly, the same also goes for the various other Chinese and Japanese patents for electronic harmonicas, including those owned by the pioneers of electronic keyboards for the masses, Casio. 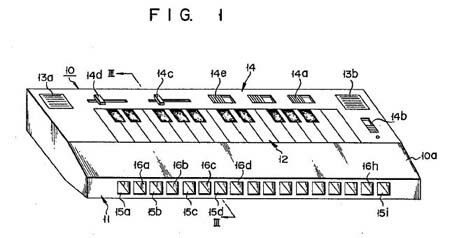 A more recent harmonica-style MIDI controller is the Xharp, developed by Wayne Read of the USA and granted US patent 9053692. A 12-hole instrument with its own onboard synthesiser, as well as a MIDI output to control an external synth, early production runs were expected to be marketed in Summer 2016, but things have apparently been delayed by an upgrade of the sensors used by the device. For up to date information, please visit their website at www.xharp.com. Another recent contender is the DM48, developed by Erik Lekholm, a biomedical researcher based in Sweden. The DM48 is an extremely compact unit, only a little larger than a typical chromatic harmonica, with no onboard sound generation of its own and just a single USB connector providing both power and MIDI output, allowing it to control any external MIDI device. Although there are no current plans for full scale commercial production, small production runs began in 2017. For more details, please visit www.lekholminstruments.com. 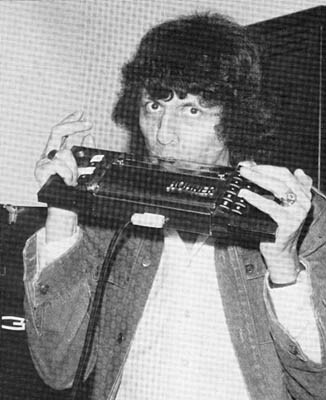 The photograph at the top of the page shows a Hohner prototype electronic harmonica from the late 1970s, invented by one Charlie Neumayer. It never progressed beyond the prototype stage. For further reading on this topic, you may be interested in Julian Vogels' "Harmonica-Inspired Digital Musical Instrument Design Based On An Existing Gestural Performance Repertoire", written for his Master's thesis in Music Technology at McGill University Montréal. A .pdf copy is available for download from his website.